Update: If you’re using Swift 4, check out the newer version of this article right here. Did you know that you can get all of this by using XCTest with Swift, too? (Yeah, OK, you probably did…) But do you know how to use XCTest with Swift? I did realize, however, that the ViewController was absolutely the wrong place to be sorting fonts (in fact, it’s absolutely the wrong place to do lots of things). So I decided to pull the sortFontNames function out into a class of its own. And when I did this, I thought, “hey, I could test that pretty easily now.” So I went ahead and wrote two tests using XCTest. And that’s when I discovered that I was sorting the fonts in a group in reverse alphabetical order (thank goodness for tests!). To test a Swift class with XCTest, you need to add that class to the test target. (Hopefully this is a temporary hack, but it’s been this way since Swift was in beta. I’m not holding my breath.) So, with your class selected and displayed in the editor, look at the Target Membership section in the File Inspector (the right pane) to make sure that both the app target and the test target are selected. Pretty simple, right? 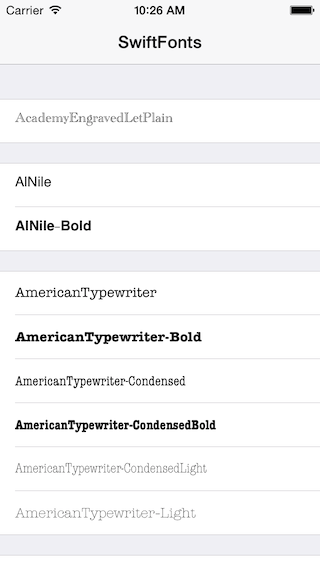 First, we create an unordered array of fonts. Then we set up our expected order. Next we ask our sorter to sort the fonts. And finally, we assert that the expected values are equal to the sorted array’s values from our sorter. And that String in the XCTAssertEqual is the message that’s printed if the test fails. All of the code for SwiftFonts is on GitHub (including these tests), in case you want to see the FontSorter or the ViewController.